Assault 220 Plus EMG® An Uncompromising Rock Machine Loaded with EMG Power! Offering an alternative take on the hard-rocking tones and shred-certified performance, Kramer's Assault series takes carved-top single cut styling boldly into territory normally dominated by the offset-double-cutaway crowd. Now Kramer brings the Assault 220 Plus EMG to the range, a guitar loaded with highly desirable features plus a set of upgraded active humbucker pickups for optimum tonal versatility. The Assault 220 Plus EMG is designed with the classic Mahogany tonewood and single cutaway styling but updated with a sharper body horn, a slimmer, more comfortable body with a belly scarf and a glued-in mahogany neck. 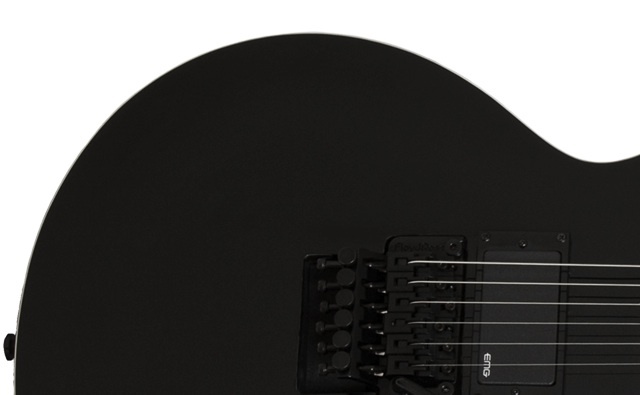 The Assault 220 Plus comes with the option of a Tune-O-Matic or Floyd Rose locking tremolo system and is finished in Gloss Black. Match that to Kramer's new back-angled, 3-3 "Assault" headstock shape and you've got a guitar that cuts a figure like no other axe out there. The Mahogany body has become legendary for good reasons and the Assault 220 Plus EMG proves its case yet again. By utilizing the warmth, depth, and creamy low-end response of Mahogany, the Assault 220 Plus covers all the sonic bases with ease. A solid Mahogany neck—glued in, rather than bolted, further contributes to the Assault 220 Plus's resonance and sustain, while a fast SlimTaper™ profile and 24-fret Ebony fingerboard lets you rev up all the speed you can muster. In another twist, the Assault 220 Plus EMG is built to the 25 1/2" scale length that many shredders prefer, offering tight, thumping lows, crystal-clear highs, and shimmering harmonics.